Size : 15.0 x 19.3 inches. / 38.0 x 49.0 cm. Description :Decorated with ships and monsters in the sea. Orientated with east at the top. With the signature of G. Blaeuw lower right corner. Shows the Pacific coast of South America from Ecuador (at the left-hand side) as far south as the Atacama desert in the northern reaches of Chile. 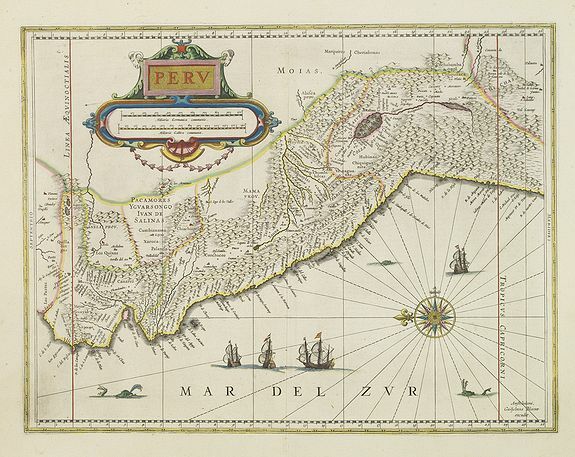 "As early as 1520, Spanish settlers in Panama had heard tales of a powerful civilization rich in gold that lay to the south, and in 1522 an expedition was organized to find this land and the people called Birú or Pirú in the south. In 1524 Francisco Pizarro led the first of his expeditions that led ultimately to the discovery and conquest of the Inca empire which extended over wide areas of modern Ecuador, Peru, Bolivia and part of Chile. Condition : In good condition. Some marginal water staining. French text on verso.